Play mobile poker at one of the world's biggest rooms. 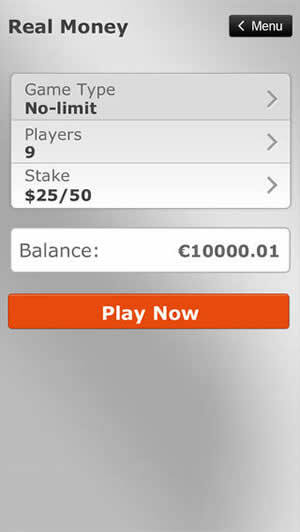 PartyPoker is only available on Apple iOS and Android. Texas Hold'em ring games and Fast Fold poker games. Sit and Go's tournaments now available at all stake levels. New mobile players at Party get a $50 welcome bonus. Party Poker is a major network site that helped shape the gambling industry as we know it today, so it should come as no surprise that the new iPhone poker app from Party Gaming adheres to the highest standards when it comes to quality and customer safety. Despite a few minor omissions and flaws, Party Poker mobile allows you to become a part of a massive player pool and play Texas Hold’em with all kinds of people from all over the world. The new PartyPoker app can be downloaded free of charge from the official iTunes store by following the link directly from the Party Poker site or by scanning the QR code. The iOS version of the app is available exclusively in countries that have already legalized and regulated on gambling, such as Austria, Azerbaijan, Canada, Czech Republic, Germany, Ireland, Luxembourg, Mexico, Netherlands, Norway, Portugal, Russia, Slovakia, Sweden and the United Kingdom. Unfortunately, if you live in a country that hasn’t been listed above, you won’t be able to use the mobile app. The app itself is rather small, which means that the download and installation process is very fast. Once the setup process has been completed, you should be able to log in using your PartyPoker account. However, if you’ve never used the desktop client, you’ll have to register with the site. The entire process is very simple and requires you to provide the support staff with some basic personal information. Furthermore, you should keep in mind that the app doesn’t support banking on the go, which means that all deposits and withdrawals have to be handled on your desktop computer. On the bright side, Party Poker offers a neat welcome bonus, which is a 100% match on your first payment and allows you to grab up to $50 for free. 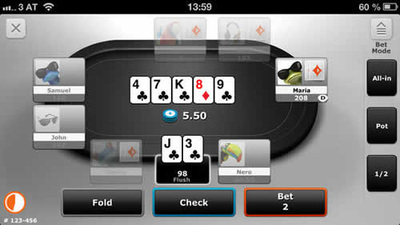 The PartyPoker app for iPhone and Samsung Galaxy devices has been released fairly recently, so it should come as no surprise that its visual theme is very similar to the new layout of the site. This means that the traditional green and white has been replaced by white, silver and orange, which gives the app a slightly more modern look. The main lobby allows you to choose between playing for real, playing for virtual chips and a short guide showing off the key features of the software package. The guide is rather short and doesn’t provide you with information on every little detail of the user interface, but it’s definitely more than enough to allow you to start playing right away. 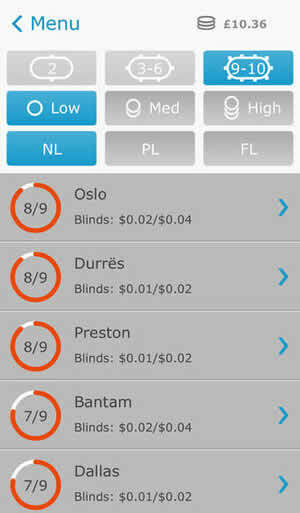 Unfortunately, customizing your experience isn’t one of the strongest points of the Party Poker iPhone app – the only gameplay-affecting options that can be tinkered with are the ability to toggle automatic blinds on and off and to switch between a traditional two-color deck and the popular four color design. Like many other iPhone poker apps, the new Party Poker software is all about Texas Hold’em. Whether you prefer standard full ring cash games, short-handed tables, heads-up duels or fast fold poker, the Party Poker iPhone app will have you covered. Unfortunately, you won’t be able to play other popular poker variants like Omaha or Stud. Play Sit & Go tournaments against thousands of other players with a wide range of stakes. Finally, it is worth pointing out that fast fold poker isn’t available in play money mode. On the bright side, the aptly named Fast Forward Poker will allow you to play dozens of hands per hour, which should be more than enough to compensate for the rather standard lack of multi-tabling functionality. In the end, the available poker variants probably won’t impress anyone, but when it comes to classic Texas Hold’em action, the Party Poker iPhone app simply sets the standards for other sites to follow. The PartyPoker Apple iOS app is rather compact, which means that virtually every visual effect has a purpose. Consequently, reading the action in table mode is very easy even when viewing the screen from a distance, which really fits with the app’s flagship Fast Forward Poker mode. The app does contain limited amounts of eye candy including customizable avatars, but in the end it’s fairly obvious that the developers were going for maximum functionality instead of flaring special effects. Finally, you should be careful about playing for real money whenever your phone has limited connectivity, as the app will automatically fold your hand if you disconnect from the server. As mentioned above, Party Poker is a part of one of the largest poker networks in the entire world, which means that many of the players that you’ll meet at the higher stakes are hardened regulars. Consequently, inexperienced poker enthusiasts should probably stick to micro and low stakes, as the level of competition is fairly high. Keep in mind that some of your opponents will be playing on a PC, which gives them access to specialized poker tracking software. On a brighter note, the tables tend to be packed with players even late at night or early in the morning, which means that you’ll be able to find some action all around the clock regardless of the stakes that you prefer to play on. The PartyPoker Android and iPhone app is an excellent choice for all kinds of Texas Hold’em fans and allows you to join some of the hottest fast fold poker and Sit and Go action available on this platform right now. Unfortunately, the Party Poker mobile client suffers from the same flaws that plague most of the other similar apps, such as the complete lack of multi-tabling functionality and more exotic variants of the game, including Pot Limit Omaha and Seven Card Stud. However, if you tend to focus on Sit and Go tournaments, ring games or heads-up play, this application is pretty much guaranteed to satisfy your needs even if you’re a seasoned poker player.